Posted January 16, 2017 by admin & filed under Skincare. Scars are a natural result of the human body’s process of healing itself from trauma to the skin. When the skin is broken or cut, the body responds by producing Collagen (a naturally occurring protein) to repair the injured area. Often the body will overproduce Collagen, creating a buildup. When this happens, the result is a large, firm raised scar. Scars of this type are often referred to as Keloid or Hypertrophic scars. While their appearance may be unsightly, they are both non-contagious and benign. Usually, there is little or no pain or physical discomfort associated with these scars. There are exceptions however, such as when a larger scar is located on a knee or elbow such that it affects mobility. 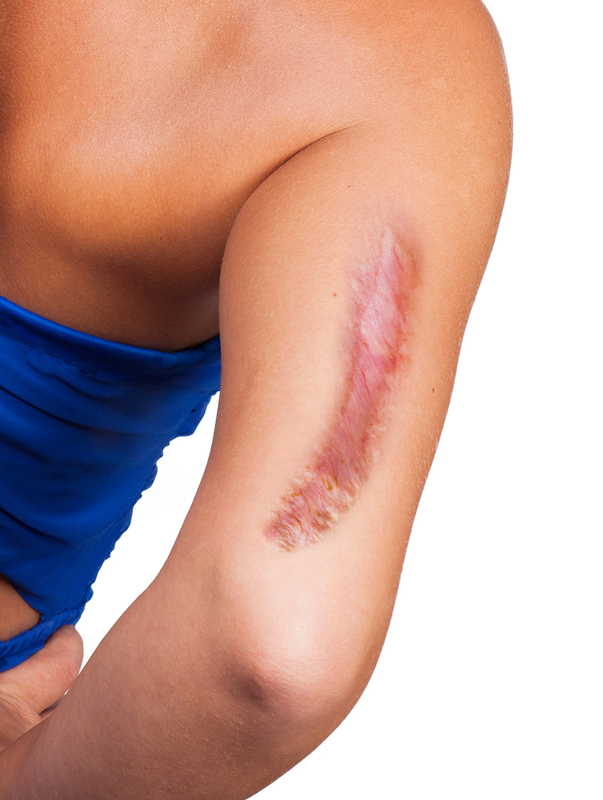 In most cases, there is no medical need to remove a scar. That said, for some there is an emotional aspect that warrants attention. For example, the scar may serve as a reminder of an uncomfortable or unpleasant event. For others, the unsightly appearance of a scar may cause distress, or in extreme cases even depression. Should one want to remove a scar, there are several options including surgical excision, steroid injection, laser treatment, radiation and cryosurgery. The best method of treatment for one may not be best for another. The age, severity, location and size of a scar are all factors that might determine which method of treatment is most appropriate. A specialist such as a Board Certified Dermatologist or Plastic Surgeon would be a good source for advice on treatment options. For those wishing to avoid medical procedures, non-surgical topical treatments such as Scarfade Scar Gel have become increasingly popular in recent years. Research suggests products which include silicone as their main ingredient are the most effective. It is believed that silicone acts to regulate Collagen activity, preventing overproduction of the Collagen that leads to abnormal scarring. The silicone also creates an optimum healing environment for scars by protecting and hydrating them while also reducing itching. These over the counter products tend to work best on scars that are still active, which generally includes scars that are two years old or less. Please feel free to call or email us if you have questions on this or any other skincare topic. We would love to help in any way we can.